There seems to be a never ending supply of projects that capture my attention and obsession for various lengths of time. Some of them are necessary for the house and garden to operate without falling apart- fence dog out of garden, protect chickens from raccoons, plant garlic before ground freezes- and others seem to stem from necessity- how do we use up all this lard from our pig? ?- and then turn into the somewhat frivolous, put-a-whole-lot-of-extra-work-and-money-in, giant mess-making, kitchen- and basement-consuming tasks. This past weekend’s was making soap. Like, real soap. Like, with pig lard and lye and safety goggles!! So, forget all other projects on the docket and off to the store for coconut oil, avocado oil, lye, cinnamon and lavender and orange essential oils… Poor David- he tolerates so much. So much. I used a few recipes online (here, here, and the one above) to settle on a lard percentage of 35%, with coconut (25%), olive (20%), avocado (15%), and castor oil (5%) supplying some better lathering and cleaning properties. Apparently you can make soap out of pure lard, water and lye, and you can also make soap out of pure vegetable oils, but a mixture seems to be what most soap makers online recommend. I found that lard was somewhat controversial, but its best inexpensive replacement in veggie soaps is Palm oil, which is not very sustainable/socially conscious. (Apparently most commercial, non-hippie-greenie soap contains beef tallow from factory farms/rendering plants, which I did not realize!) Without lard or palm oil, soaps can take a very long time to cure into a nice hard bar that won’t melt when wet- sometimes a year or more- compared to 3-6 weeks for soap with. We decided on three varieties- David wanted cardamom paired with orange, and I went with lavender and rosemary oat, and pumpkin pie spice (inspiration). I won’t bore you with all the details- the links above describe the process very thoroughly- but suffice it to say that it was both easier and harder than I expected. The whole process was quite scientific- which I loved!- tweaking my recipe, calculating the exact amount of lye needed online, measuring out the lye and fat to the gram… Working with lye wasn’t too scary, but getting the melted fat and lye+water mixture to thicken took forever. I failed to realize that most people use a stick blender, which shortens mixing time by an incredible amount. Also, sometimes the combination of essential oils, and in this case pumpkin purée, can cause the mix to separate. So the orange cardamom and rosemary oat loaves set up well overnight, but the pumpkin began to ooze dark red cinnamon oil. It looked evil. Fortunately, the interwebs told me I could just melt down the failed loaf, oozing oil and all, mix it up really well, and pour it back into the mold. While doing this, I added some powdered milk to cut the now-fireball level of cinnamon fragrance coming outta that thing. Whew. Really hoping that mellows out! I cut each loaf into bars after it sat overnight in its mold (tupperware and a loaf baking tin), and now they are all sitting on parchment paper in the basement, waiting to cure. I’ve gone down to marvel and sniff them at least three times a day so far, and I’ll turn them every week for 4-6 weeks until they’re done! 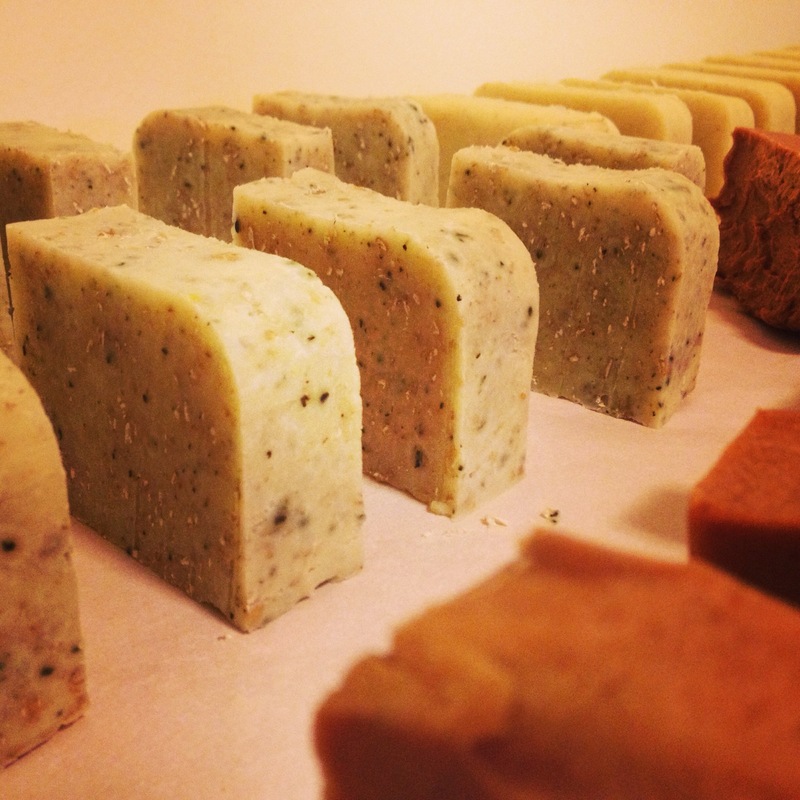 Now I am hooked and looking into making a vegetarian bar for my brother-in-law with shea or cocoa butter… they say soaping is a disease that takes over your life… and all available flat surfaces in your house for curing bars of soap. 3 of 5 jars of rendered lard from our pig, which have been sitting in the freezer since last April. Weighing out coconut oil. Also beautiful, and tasty! Melting down the mix of lard, coconut, olive, and avocado oils. Ingredients for the oat bar, plus lavender essential oil. This is before the pumpkin loaf started separating. Evil looking pumpkin pie soap during the re-melt. There they all are! This room smells amazing! Close up of the lavender and rosemary oat. Last weekend down on the farm David and I set up a site for a new garden. We built a bamboo-post electric fence around it- an area about 25 by 50 feet- on Saturday, and then Sunday we moved the 3 pigs from their old pen into the garden site so that they would dig up the grass for us. Given all the trouble it was to get the fence wired correctly and and get the damn pigs into the area while fending off a swarm of horses, it may have been easier just to tear out the grass ourselves… But the pigs were so, so happy to have a new pen of fresh grass that it was worth it. I wasn’t able to get pictures or video of the chaos that ensued when the horses caught wind that we were leading the pigs to their new home with a big bucket of food, which sounded like a bucket of grain, but really, anything in a bucket makes the horses swarm. They’re like a pack of piranhas! Anyway, hopefully by this weekend most of the grass will be gone and we can start planting veggies and cover crops. Pig poop is one of those manures (like cat, dog, or human manure) that you’re not supposed to use directly on edibles unless it’s super well aged and composted, so this season we will be planting edibles whose edible parts do not touch the ground (like corn), lots of clover cover crop, and things like kale and squash that we can feed to the pigs, chickens, and ducks (which arrived today in the mail!! We now own Ancona ducks!). We’re also going to start a couple things that won’t produce well until next season anyway, like strawberries, raspberries, and rhubarb. So excited! After 3 years with our small yard in Seattle, this garden will be HUGE!! The pig herding is about to start. Here’s David in front of the old pig pen, bucket of bait in hand. and then magically, the pigs were in, the horses were out, and there was calm. Munching grass in front of their temporary shelter, The Space Hut. David anchors the Space Hut. Yes! That’s what we want! Root root root! And lastly, this is Heather taking a lambnap with Olive Ewe.